BLESSED ARE YOU OH LORD OUR ELOHIM, KING OF THE UNIVERSE! The Spirit and the Bride are saying Come Lord Yeshua! This is a great mystery but the Holy Spirit is doing the work of Father YAHWEH in the earth as we pray and submit to Him. Standing and kneeling with uplifted hands, bowing the head and knees and laying prostrate with one's forehead on the ground are the Hebrew Biblical words for "worship" which few understand. They are mighty prayer postures which do much in the spiritual realms and bring forth tears of repentance and prayers of intercession very quickly! The Lord showed me, "Satan hates to see my servant on her knees for then he knows he has lost his battle". So whatever you are going through... this is the best way to humble oneself before the Lord and resist the enemy for it cannot happen unless the soul (mind, will and emotions) as well as the body and spirit are completely submitted to God. God will draw near and make Himself and His will known to those who are humble but "the proud He resists afar off". See 1 Peter 4:5-10. This is because the Lord is Himself humble and meek and lowly of spirit... as well as being the Almighty El Gabor, judge, deliverer etc. Thanks for coming and please make a comment and come back as I start posting prophecies for the Bride of Messiah from our Lord. Prophecy is given to make known the heart and mind and will of the Father to His people. It comforts, encourages, instructs in righteousness and also exhorts towards good works. If we don't hear from the Lord we can "perish"... growing spiritually tired, weak and innefective in His vineyard... even falling away from the faith as many are doing today as they go after all the New Age churches and Interfaith and Ecumenical Movements which they "think" in their carnal minds are so good. That is not of the Holy Spirit's Anointing and blessing of Unity however. 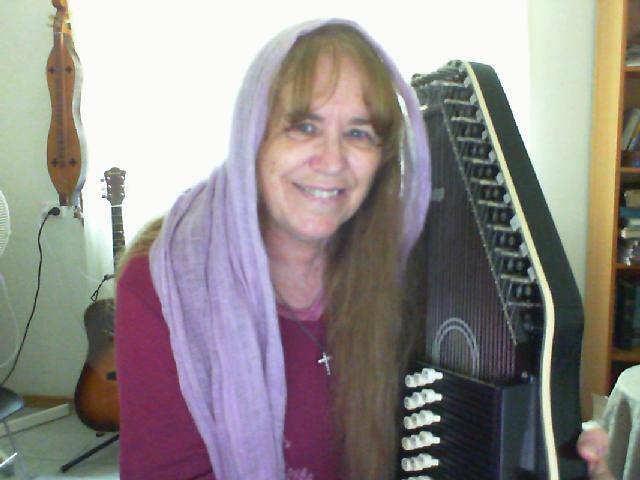 I'm a Messianic New Covenant Christian, prophetic psalmist / singer / songwriter, wife and mother and my desire is to encourage others in the ways of the Lord. He says we won't be disapointed when we see Him as He really is! I've been a believer all my life, raised by Christian parents and extended family... but didn't find out about the Baptism of the Holy Spirit until I was about 30 years old. Soon after that amazing experience of having my heart circumcized and living waters bubbling up inside me... feeling a new Loving Presence inside my heart, being healed of a life long sickness and 12 dreadful months of encroaching darkness of depression... I came to realize Jesus is Yeshua the Messiah of Israel. His Holy Spirit has been like the Menorah Light... my teacher since then... revealing Truth... teaching me to worship at the Alter of Incence and eat at the Table of Fellowship in communion with the mystery of the Faith... ministering to others in the outer court and taking me through many years of personal testing and learning experiences. I know this is the same for many others who are like Esther... being dressed and prepared with both bitter Myrhh and sweet Aloes to go before her husband the King. The Holy Spirit is setting this aside as an anointed place to share extracts from some of the encouraging prophetic Words and messages I've received from the Lord... both for myself and His Spiritual Body of devoted followers. They come forth from my heart as a stream of Living Words during times of prayer and worship and have the power to bring nourishment for the spiritually hungry and thirsty. Yeshua's words are the Living Bread of Life... even better than the supernatural manna that came down in the wilderness long ago and fed the children of Israel. So don't look back at Jewish history which was a forshadow of things to come through the "seed" of the Royal House of David... the Messiah King Melek! Ask the Father for the promised Gift of the Holy Spirit... to give you wisdom and revelation knowledge of Him Eph.1. Also that He will circumcize your hearts Eph. 2 and join you into the mystery Eph. 3 and 4 graft you into the Commonwealth of Israel and holy Nation of Israel according to 1 Peter 2:9-10 and Romans 11. Be aware there is both a natural and spiritual Israel. "First the natural, then the spiritual" One is of the earthly Kingdom of God and the other is of the Heavenly Kingdom of God. So keep your heart and renewed mind on things above where you are ALREADY sitting with Yeshua / Jesus Christ in Heavenly places at the right hand of God. See Collosians 3. Press forward by faith, walking, talking, living and singing in the spirit... into the manifestation of the prophecies that have yet to be fulfilled. Repent of sin and forsake the worldly spirit of this world. Keep your bodies and eyes pure as "doves" for the Beloved One. Know who the LORD is... the One who spoke with Moses and the prophets as the Angel of the Lord... "for His Name was in Him"... YAHWEH the manifested ELOHIM of Israel... who also humbled Himself and manifested on earth in the flesh, as a Jewish man called Yeshua. His name means YAH-SHUAH or Yah is salvation. Through Him YAHWEH has extended the Way of Salvation to mankind if they will but repent and be baptised into Him... into HIS NAME / PERSON / PRESENCE and receive the Gift of His HOLY SPIRIT of Love and Power! See Phil. 2:3-11 and John 1. Also know who your enemy is... all those who oppose Him and you as His holy people and set up other religious concepts to delude and lead astray from this Reality and His all wise plans and purposes. They are carnal and resist the Holy Spirit. Yeshua said "I am the way to the Father"... so only follow Him. ONLY entrust your soul unto Him! Please see my other websites for much more.